​GC-SOS® is an innovative program for the simulation and optimization of Gas Chromatography separations, for method development and teaching of chromatography principles. GC-SOS is the premier simulation tool for developing the most efficient GC methods! ​Why use GC simulation software? GC method ​development is a time consuming and challenging task. Even veteran chromatographers find it difficult to manually optimize a method. In fact, it's quite difficult to accurately ​guess how the complex interactions of temperature, pressure and column size impact a separation. Manual trial-and-error approaches often produce sub-optimal separations, ultimately leading to lower performance and higher costs. The use of simulation and numerical optimization is the most effective way to achieve significantly faster method development, improved separation performance and lower analysis costs. GC-SOS is the most advanced, powerful, and easy to use GC simulation program available. First released in 1996, GC-SOS has been used globally by leading companies, universities, and government agencies. The program was completely upgraded and re-launched in 2017 exclusively online. Our newest version continues a tradition of innovation, with proprietary features including enhanced numerical optimization, flexible requirements, improved accuracy, ​and animation. A method can be optimized in less than an hour using GC-SOS. Simply enter run conditions and retention data from 1 to 3 training run(s), then simulate the effect of new conditions. 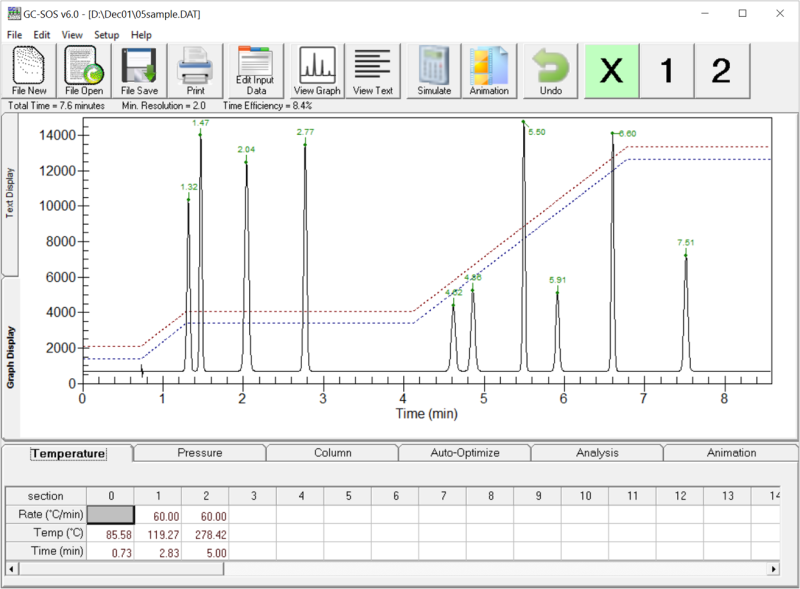 Instantly evaluate the effect of different temperature &/or pressure programs, or different column sizes. Use the proprietary Auto-Optimization function to quickly determine an optimal method with improved peak resolution and lower run times in seconds. Optimized methods provide greater separation performance, including improved resolution and lower run costs. Our 100% satisfaction guarantee insures there is no faster, easier, or more effective way to develop the most efficient GC methods. Accurate simulations quickly made via a single click- never wait for an experimental run again! A high resolution plot shows simulations as they would look on a real instrument. Instant run analysis determines separation efficiency. A remarkably effective way to optimize separations and demonstrate chromatography principles. This separation was optimized in just a few minutes, providing improved resolution and 50% reduction in run-time! improved resolution in 1/2 the time!
" .. well designed and easy to use... an essential tool for method development." " I like being able to make simulations based on my existing separation." ​" The Automatic-Optimization function is amazing!" ​" .. more effective than traditional trial-and-error approaches." " Our optimized separations are now significantly more efficient- saving both time and money." ​" We use GC-SOS in our Gas Chromatography training classes."